A.M Ran Top of Utah marathon in 2:28:42, first half in 1:10:57, 4th place, got beat by Hobbie and two Kenyans, details to follow later. OK, now finally found a moment for details. They will be getting posted incrementally. Woke up in the morning, and felt like boxing. Good feeling. Kory was happy he did not sleep in the same room with me. Started the morning with a scripture study as usual. Read in Alma 14 about how Alma and Amulek burst the bands they were tied with and made the prison collapse through their faith. Something to learn from them. Then read in Ezekiel 34 about the shepherds who feed themselves but not their flock. Both scripture chapters applied to the race in a way. I was going to work on bursting the bands my unbelief, and I was going to race a guy named Ezekiel, first time I actually met anybody by that name. I have a special respect for the nation that goes that deep in the Bible to find the names for their children. God had to bless them with something for that, and He did with running speed and endurance. Jogged about 0.8 from Hotel de Petersen (aka Paul's house) with Paul and Kory to the bus loading area. Made up a geek joke that only a runner with some Unix sysadmin/programming background could understand, fortunately Kory was in that group so there was somebody to share that joke with - what do you call missing a bus? Answer - Bus Error. Quick explanation of why a geek would laugh - you get a Bus Error when a program royally crashes, it is like when somebody loads a tray loaded with something you really do not want on the floor, and at the most inconvenient moment it all comes crashing down. Having created and shared the joke, I nearly got the Bus Error myself. I realized my chip was back at Paul's house. So ran there, got it, and barely made the last bus. This gave me a good warm up, though. Ran another 0.5 to visit a VPB (virtual private bathroom), then I was ready to race. Trouble at the start: Hobie Call, two Kenyan - Ezekiel Ruto (PR of 2:14) and Joseph Sitienei (PR of 2:11), and the dark horse Steve Ashbaker. Talked to Hobie, admonished him to start out on pace. He assured me it was his plan. Last year he missed the qualifier because of goofing around for the first 6 miles. He told me he was going to hit the half in "something crazy like 1:07". I told him it was not crazy at all and that he had the fitness to run the first half in 1:07 and live. Talked to Joseph, he said he wanted this to be a training run before Twin Cities, keep it at 2:35. I wondered why he had to come all the way here to run 2:35 for a training run. There was going to be no money except may age division prize for running this slow. I figured he would soon realize he'd have to do his training run a lot faster to come home with cash. As I already stated earlier, my plan for this race was "and should we die before our journey's through, happy day all is well. We then are free from toil and sorrow too, with the just we shall well. But if our lives are spared again, we'll see the saints their rest obtain. Oh how we'll make this chorus swell, all is well, all is well". I wanted to go out hard, put myself into a state of struggle and learn to power through it. I also wanted to test my suspicion that the reason I slow down on the second half is not so much fuel as it is plain neural fatigue. My hypothesis is that if make the first half hurt, the nervous system is tuned for driving the second half, but otherwise, it just goes to sleep even when there is plenty of fuel. I debated whether I should go out with Hobie at his fast pace. But his watch died, and I figured I could be there for him at least in the first mile to give him his split. He took out fast. My GPS reported the first quarter as 1:11 (it was a bit short, as it turned out, but I think we did get at least 1:13). I told him, do you realize we are going around 4:40 pace? He had a response full of faith - that's OK, the Trials will be fast, we'd better get used to it now. Fortunately for me, we did ease off a bit, and hit the first mile in 5:02. That did not hurt too bad. I figured I could give him another split at 2, and maybe if he eased off to 5:15, even make it to 3 or 4. The second mile was 5:08. I gave Hobie the split, and backed off to 5:23 on the next mile. Joseph came up on me shortly after 3, I decided to go with him to 4, then felt good enough to make it to 5. 5 miles in 26:08, keeping my head above water, staying ahead of the 5:20 guy while the downhill lasts. No significant tail wind, but now headwind either, which is very nice. Backed off after 5, but Joseph is still not too far ahead. Saw Hobie cross the 6 mile mark from afar, his split was faster than 30:51. Then I knew that barring a very serious disaster he would be sub-2:20, more likely 2:18. With the downhill becoming more gradual we slowed down to around 5:30 - 5:35 pace. Joseph was running ahead of me, but not putting any distance. At the downhill around 7 mile marker I just let it go with the Sasha downhill maneuver and caught up to him. Drafted a bit, then he invited me up front. I suggested we share quarters. He agreed. The alliance did not last very long, though. He asked me, how fast is that guy up ahead. I told him I was fairly certain he would run to 2:18. The moment I said it, he just took off, and was gone. I think that move cost him the second place, though. 10 miles in 53:36, 5 mile split of 27:28, not bad for the reduced downhill and no wing-endowing tailwind. Still ahead of the Trails Qualifier guy. Around 12, Ezekiel went by. He was in a hurry, I could not even think about latching on, and moved away from me fast. Tail wind picked up a bit, I hit a 5:32 mile from 12 to 13, got to the half in 1:10:57. Then the wind just carried me from 13 to 14, I felt like I had wings, 5:22, and one more mile on the Hollow Road in 5:32. Hit 15 miles in 1:21:15, right on pace to the second for the Trials Qualifier, which was exactly my plan - make it to 15 on pace, the rest does not matter. From that point on, coasted with the idea that anything sub-6:00 was good. The downhill was pretty much over, there was no tailwind, and we had some unpleasant rolling hills up ahead. Had to make a VPB stop shortly before 17. Got to 18 in 1:38:48. The next two uphill miles in 6:04 and 5:58, 1:50:50 at 20. Pushed it hard on the downhill mile (0.5% grade) from 20 to 21, got 5:46. I decided to use a different mental approach on the second half. Instead of thinking, you have X miles left, hold back, I was thinking, push hard the next mile, then if you die, just jog in, but push hard that one mile. It worked very well, I kept feeling strong in spite of pushing it. I suspected from my training that I should have been able to run slightly over 6:00 on a flat/slightly rolling terrain at 4500 feet with no glycogen in the muscles, and I wanted to prove it to myself. Mentally, it was very hard and scary. I knew what I had done in the first half. However, around mile 14 as the tail wind picked up and was carrying me, a song came into my mind, based around Proverbs 3:5 - I'll trust in the Lord with all my heart, and will not lean upon my own understanding. In all my ways I'll acknowledge him, and he will direct all my paths. This tune stayed in my head for the rest of the race. It gave me the courage to keep pushing for one more mile without the fear of the consequences. Over the next 4 miles I hit a string of 6:12 over the rolling hills and frequent turns. Again, taking it one mile at a time. Then as I was climbing the hill on Main street on approach to mile 25, I was able to remember how I felt there a year ago. I thought, there is no way I could qualify in St. George with a tendency to be this weak this late in the race and running this slow. The thought of even trying scared me. This time it was different. I felt no fear. I confidently charged up the hill feeling more strength on it than I ever have. I visualized mile 25 of St. George, being on pace for a Trials Qualifier, and being confident that if I gave it all I've on the last mile, I'd get it. This vision did not scare me, it did not look impossible anymore. I was not afraid of the pain of that effort anymore. At this point I knew that I had accomplished the purpose for which I had entered this race. I had broken the wall of doubt and fear. Mile 26 started uphill, but then flattened out, and had a quick sharp drop. I felt strong, but had a hard time shifting gears, got 6:10. Then my favorite trooper appeared out of nowhere on a motorcycle. Yes, I have a favorite trooper. He was there with me when I won in 2003 and 2004. He was also there when it was not my turn to win, and still cheered for me in other races. Somehow he intuitively knew exactly what I needed. He turned on the flashing lights and the siren. I forgot everything, and went into the kick mode. The response I get from the flashing lights and the siren would make you think I have a history of juvenile delinquency or something like that. I managed 1:12 on the last 385 yards, uphill, that is around 5:30 pace. I felt like I could have held it longer, but not faster. I wonder what would have happened if he showed up at 23. 2:28:42 at the finish, first time under 2:30 since 2003 and second in my life on a non-St. George course of correct length (I ran 2:25:30 in DesNews 2004, but the course turned out to be short). Hobie won with 2:16:39, then Ezekiel Ruto with 2:24:27, Joseph Sitienei 2:25:42. Steve was 5th with 2:36:43. The bloggers controlled the top 15, taking places from 4th to 12th. Congratulations to Kory, Cody, Adam, and Jon on setting PRs. P.M. 0.5 with Julia in 4:22, 1.5 with Jenny in 14:23, then 3 with Sarah in 29:23. Pushed the double stroller with Joseph and Jacob. No noticeable side effects from the race aside from a small tenderness in the lower back (gone after 10 minutes of inversion table), and a small staleness in the legs. Great job today, though I am looking forward for the details. Don't wait too long to post them. I knew you would run good when I saw where you were at around the 1/2. Good job! Good running Sasha! Way to scare the Kenyans. Do you have any idea why milliseconds.com won't load for me? It brings up some random website. Be sure to mention you probably ruined one of the Kenyans'race for Twin Cities by forcing him to run too hard today. Heh heh. Jon - try http://www.milliseconds.com/. Send an e-mail to Mac so he'll fix his virtual hosts configuration. He needs Alias milliseconds.com in the virtual host definition in his httpd.conf. What are the chances of having a headwind at SGM? Super effort. I know you'll be ready to run way faster at St. George in three weeks. You are awesome!! I have been following your blog since the Provo half, and you are very inspirational---especially to us slow pokes! Yea Sasha! So glad you caught the bus. I was thinking of you on my little run yesterday, praying for a tailwind for you. As Kelli said, you are such an inspiration! Good job Sasha. Now hopefully your ready to go out like that and hold it in STG. Katie- I live here in STG and you can have a headwind down the course any day of the week. However most of the time it is not really not bad at all. If it blows on Oct 6 like it did this Saturday then we are all done for. I fought it for the middle 20 miles of the course and it just killed me. Let's hope it was like last year and there was little to no wind. "it is not really not bad at all." Isn't that a double negative? What does this really mean? Great race, Sasha! Way to push it and get that fast time. Look out St. George! Everybody - thanks for the comments and encouragement. 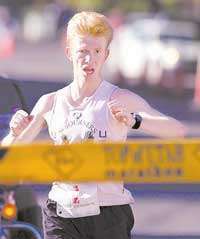 Katie - I've run St. George 6 times, and the headwind was never an issue. The worst we've had was 1998, it lasted only the first 5 miles, and you could not feel it when drafting. Quick, knock on some wood, Sasha. Great job Sasha! Wow! thanks for the detailed report. It is very interesting and inspiring to get a glimpse into what thoughts were going on in your head as you fought through this race. It's given me a whole new perspective on how I should approach racing and what a role the mental side plays. Gets me all fired up to race again going out much more aggresive than I have in the past. Thanks again. Congratulations! Your report is very motivating - even for a mid-packer. Thanks for sharing your mental strategies. Good luck at St. George. May the wind be at your back! Congrats Sasha! Like the other said, hearing the details of your race was so inspirational, especially the mental aspect. Good luck at St. George!!! My thoughts were with you and the other bloggers that whole morning and I am glad you had a mental breakthrough and broke 2:30.